Dont know about the status - I guess work is currently still in progress. But I was already able to check some own projects with it. Nice! The “PaymentFont for Seaside” project is a small Seaside wrapper for the PaymentFont project. 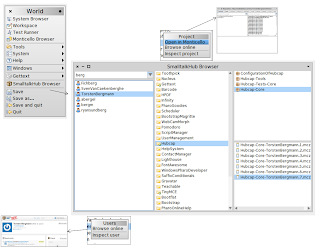 Roassal for Pharo now supports Kiviat-Diagramms. Read more here and have a look at the picture. Spur VM for Pharo, Squeak and Newspeak is also progressing in the 64 bit area. Another milestone is described here. A demonstration of a sensor network overlayed over a map and animated. Read more about it here. The goal of this project is to provide an object-oriented scripting environment for web applications running on Ruby-on-Rails. another nice article from Sven. Read more. A new infoQ article called "Introducing Essence#: A Smalltalk-based Language for .NET"
VisualAge Smalltalk 8.6.1 has been released. A presentation can be found here. Kendrick is a platform for epidemiological modeling and analysis. It helps epidemiologists craft custom analyses cheaply. It's based on Pharo and MOOSE. It's open source under BSD/MIT. using Smalltalk blocks - clean and simple. See here. Pre-built Squeak stack and stack/spur VMs for ARMv6 (i.e. Raspberry Pi) and ARMv7 (i.e. BeagleBone Black, Parallella, numerous Chromebooks, etc) are now available at the same location as the other Cog and Spur VMs. Read more. Smalltalk Foundation meeting in Portland on Monday, November 10, 2014. Next meeting of the Toronto Smalltalk User Group is Monday, November 10 on Newspeak. See http://www.smalltalk.ca for details. has just begun. If you are not there you can follow on Twitter.